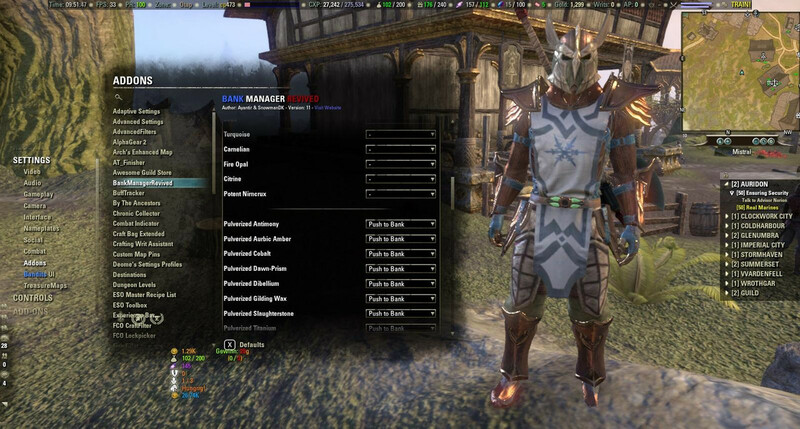 "It will automatically push or pull the specific items from your Main character inventory to the bank ou your bag. Really suited for managing mules for example because you can log your mules and take only the craft or items you want. 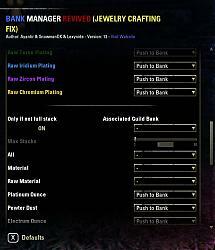 This addon is a fork of Bank Manager Revived, therefore all the features listed on that page apply to this fork as well. I am not the original developer of this addon. 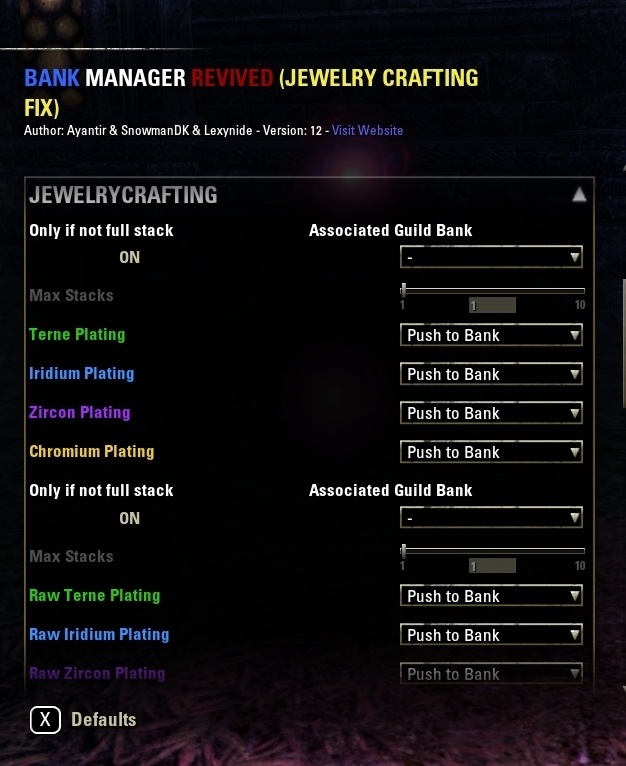 I merely took SnowmanDK's Bank Manager Revived and updated it to support Summerset Patch changes (such as introduction of Jewelry Crafting into the game and it's respective new materials). All credits of this addon go to it's original authors. Each character can have 9 profiles defined with their own rules. If 2+ profiles are defined or the current profile is not set to automatically transfer items, an UI will appear at bank to let you switch between profiles. You can easily set a name, and reset a profile. 2 sliders to choose how much to keep in bag, how much to grab from bank if you don't have enought. (0 to disable the 2nd function). 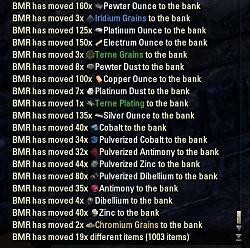 Gold sliders are 0 up to 200K, TelVar are 0-10K. Choose to push/pull 1 or + (up to 10) stacks. Choose to push/pull 1 or + (up to 10) stacks of temps. Choose to push/pull 1 or + (up to 10) stacks of raw material. Choose to push/pull 1 or + (up to 10) stacks of refined material. Choose to push/pull weapons (set excluded). Choose to push/pull heavy armors (set excluded). Choose to push/pull intricate weapons (set excluded). Choose to push/pull intricate heavy armors (set excluded). Choose to push/pull 1 or + (up to 10) stacks of raw platings. Choose to push/pull 1 or + (up to 10) stacks of refined platings. Choose to push/pull 1 or + (up to 10) aspect runes. 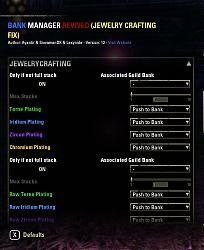 Special option for "Ta"
Am I the only one who seems to be experiencing laggyer and laggyer guild bank transactions? Maybe because of the really big saved variables. 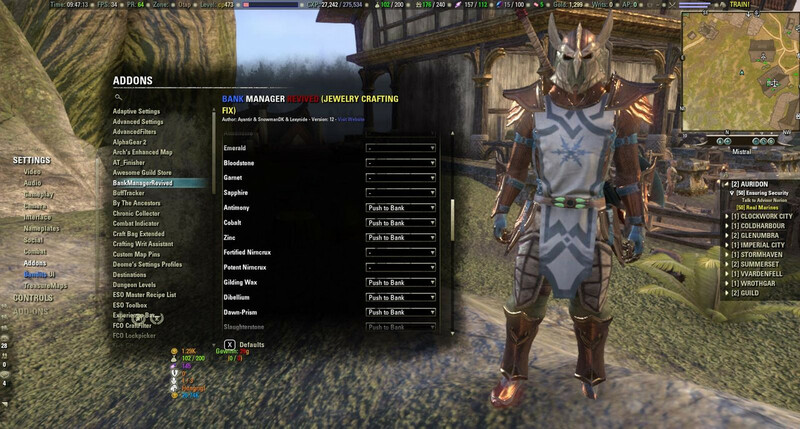 I do not use BMR for materials because of the crafting bag coming with ESO+ so i did make a slimmed version for myself. 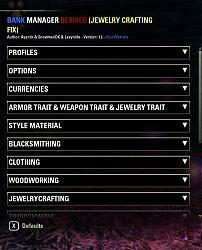 After deleting the saved vars and making new profiles with my slimmed version where i did comment unneeded functions out of the code (materials and woodworker/smith/clothier and jewelery in total) i was able to reduce the saved variables to 1/4 of the size before. 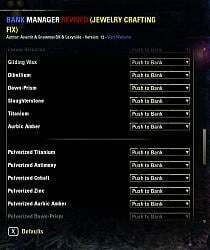 If there is any use for someone i would upload it as an optional patch to BMR. Please upload this slimmed version. Last edited by Gamer1986PAN : 04/05/19 at 10:05 AM. Thanks for looking after this addon ! 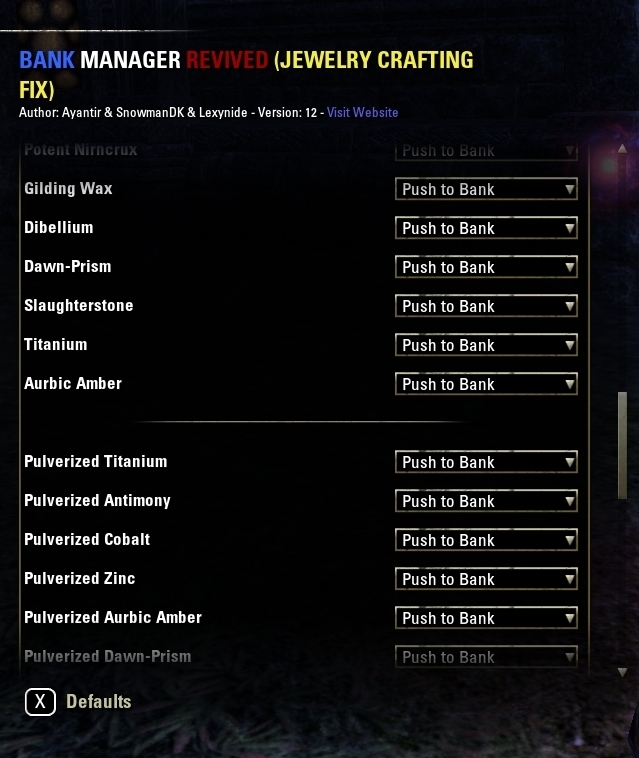 With Jewellery are you able to add rings/necklaces as well ? 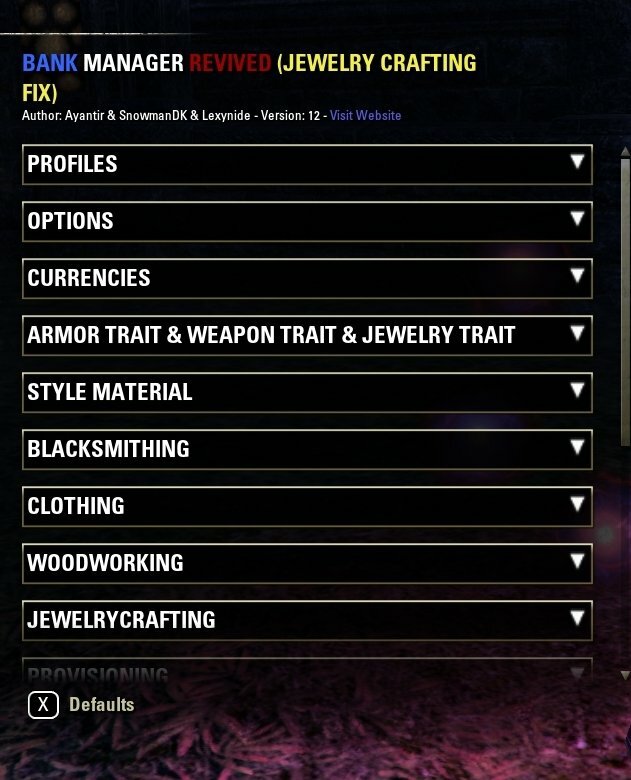 Also, how is this a Jewelry Fix when it ignores "Raw" Jewelry trait mats? The Pulverised mats.... 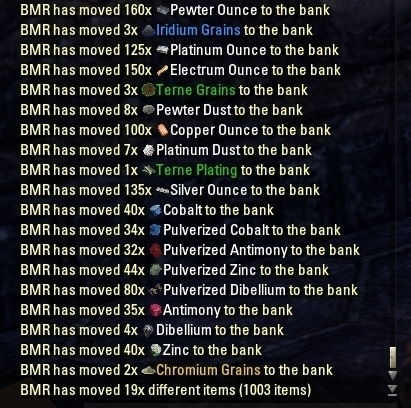 But Oddly enough, Monday's patch appears to have fixed whatever was broken with enchantment runes being deposited to the guild banks. Last edited by SteveCampsOut : 02/26/19 at 04:05 AM. 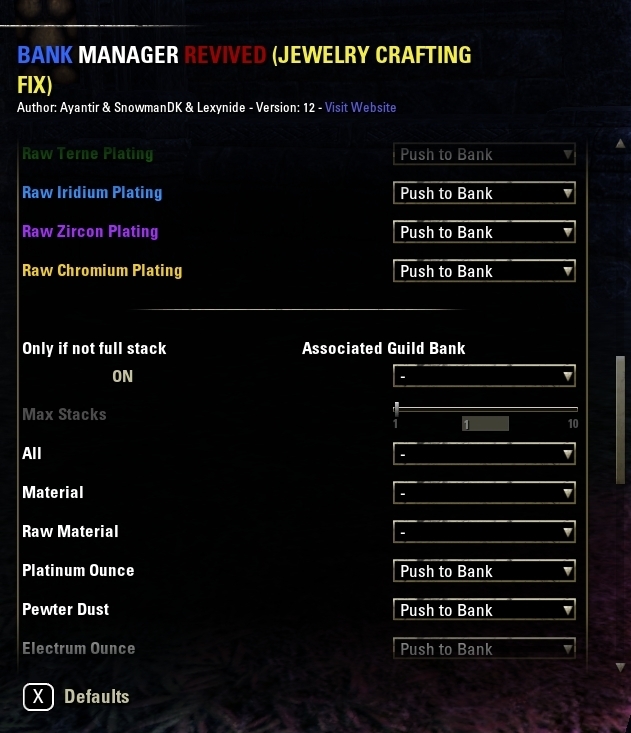 This addon like the original still refuses to deposit enchanting runes to my guild bank. Yeah same here. No effect whatsoever. I could list out what I have if you are interested. So, basically, this option suits me, but maybe I missed something. Thanks for adding the jewelry. I had a bit of a hack I did to my copy to include it, but glad to see an official update. So will you be taking over the add-on? I only ask because there are some bug/annoyances that should be addressed. They maybe from the layers of programmers that have patched and modded it over time.